After the British landing on Long Island, Clinton was ordered to take an elite force and make a night march around the Continental left flank. While Clinton made the night march, Grant attacked the Continentals at Gowanus road, while Heister in command of the Hessian troops, attacked the Continentals along Flatbush road at Battle Pass. The attacks were to hold the Continentals in position and distract them from the main army coming around the flank. • The 14 hill hexes are a start turn Temporary Majority Victory Banner Objective worth 1 banner. The banner for this group of hexes goes to the side that has units occupying an absolute majority of these hexes. Place a Continental Victory Banner on a hill hex at the start of the battle. 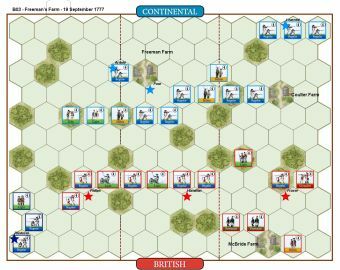 • The road hex on the Continental baseline is a Temporary Victory Banner Objective worth 1 banner for the British player when a British unit occupies it at the start of his turn. 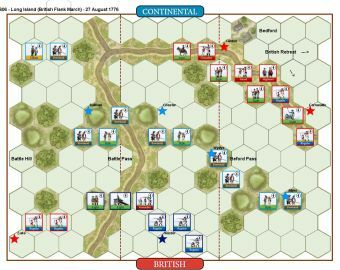 • A unit or leader in the British flanking force must retreat onto a hex to the British player’s right map edge or to a bottom/right hex. Another 8-7 win to the British in a hard slog. The players can't believe how hard this scenario can be but for the Americans the simple tactic of just shoot anything is the game changer. We replayed the game and it was another 8-7 win to the British which could have gone the other with General Miles storming the British gun on the road after destroying the end British regular infantry unit with musketry. 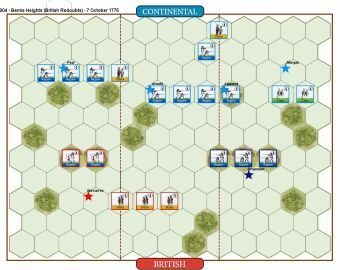 The British luckily escaped by playing a First Strike and killing Miles' provincial infantry although Miles escaped. The highlight (or low light!!) was the British Guards routing after failing a 7-dice rally attempt. The Grenadiers and Lights with Clinton leading cleared the centre to save the day. 8-7 British win, and a 4 hour match. 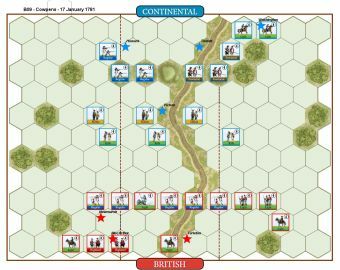 The disparity of forces is high, the Brits have 17 units including cavalry and artillery with 4 leaders against 12 infantry units and 4 leaders, and the British units have a qualitative advantage in infantry. This should be a easy win for the Brits, yet seems to devolve into a tough fight each time. The Continental Riflemen seem to be the best offensive Continental Units, and the Provincials sit it out on the hills and make the Brits pay. A close-run 8-7 win to the British, with the tenacious American Provincial Infantry scrapping it out. The score line was sitting 8-8 but the Americans lost the hill advantage and the British Guards took the road. Arguably, the Americans were now surrounded and the survivors would have largely surrendered. An American volley destroyed the British Grenadiers (3 hits in a single line volley!) and the Grenadiers routed taking General Clinton with them. General Cornwallis got revenge by wiping out the American left despite General Miles usual heroics. Heister's Hessians advanced into withering American fire and the Hessian Grenadiers succumbed. The British took their chance and advanced the now unopposed flank march down the road and put he Guards, Light Infantry and Artillery in the American rear. An American Provincial Infantry unit attacked the Guards but were First Striked and wiped out before they could strike back. The Guards put a volley into the rear of the next Provincial unit and it was all over. A tough fight with things starting well for the Americans (racing to a 4-0 lead) and the British then cutting down the Americans with withering line volleys and a few unfortunate routs, plus no less than 2 First Strike combats that saw full-strength American units pummelled before they could land a blow. Hats off to General Chester and his Riflemen who took down 2 units (Highlanders and Hessians). Another game and a crushing 8-2 win to the British. The flanks march combined with the mass advance of the Hessian centre saw the Americans decimated by the flanking forces' Light Infantry with Guard and Regular support and the Hessians finish the job advancing over the hills and roads. The unfortunate death of the heroic General Miles (double sabres from a long range volley) saw his command break and flee followed by the overwhelmed General Wyllys who was also killed. The loss of 5 American units on their left and 2 generals made it a walk in the park for the Hessians, only losing the Hessian Grenadiers (which has happened in every game so far). 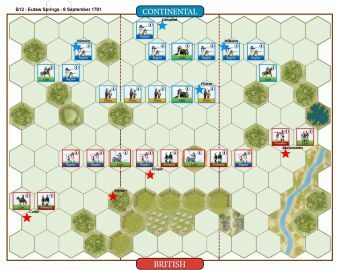 The Americans' secured a bonus point for still holding more hill hexes than the British as the British were more concerned with advancing with the bayonet than hill-sitting. This scenario continues to surprise. It looks one-sided but it just doesn't play that way. Two more games played with a 8-4 win to the British followed by an 8-5 win to the Americans. In the British win everything played out for them with a steady stream of American casualties being inflicted with fire power before a bayonet charge cleared Beford Pass and both Wyllys' and Chester's commands destroyed and both generals removed. After that it was mopping up fire from the Germans that weakened Sullivan's command and saw his Provincial infantry give way. The British Guards and Grenadiers bore the brunt of the fighting and both were destroyed - a common theme for these units two units in this scenario. The dragoons finally eanred their keep by riding down the American general Wyllys who had fled from his routed units and stood all alone and forlorn on the American base edge. The second game went poorly for the British with the two Regular Infantry on the flan k march routing (General Miles again!) and then the full-strength artillery routing. 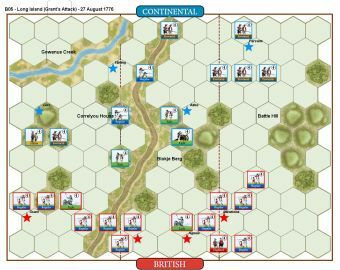 Despite Wyllys and Chester's American commands being destroyed and the Hessians advancing through Battle Pass, the Americans formed an effective last-ditch stand at the crossroads. 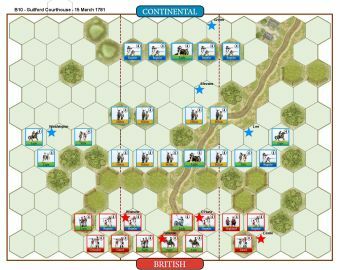 The British player was very surprised when his full-strength artillery unit routed but even more so when a full-strength Light Infantry unit routed and took General Clinton with it. 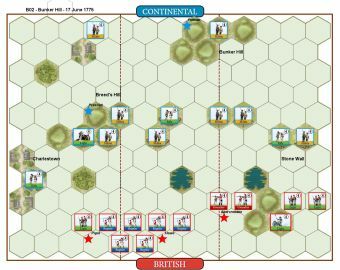 The Hessians took Battle Pass and advanced on to the crossroads shooting down several units but the loss of a single Hessian fusilier regiment whose bayonet attack against a pinned American Rifle unit was an absolute and disgraceful failure saw the British break. An unexpected result as the British had looked in complete control. What's the secret to this scenario? Well in all 3 games so far, the command of the American General Miles has performed spectacularly whilst Cornwallis has been poor (just appalling dice rolling for Cornwallis). Miles has become something of a hoodoo to the British. 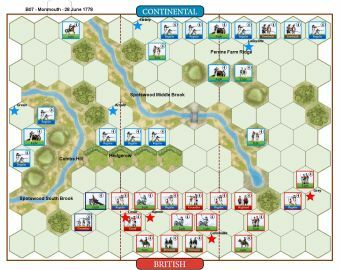 The temptation for the British is to get the flank attack of Cornwallis in straight away and whilst this clears the Beford pass quickly it usually ends in the loss of the Grenadiers and Guards and at least one Light Infantry and the whole command fragmenting. Heister's and Luke's commands are too far away to help. 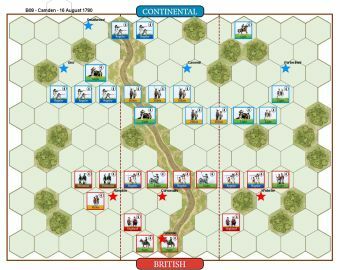 Perhaps the British need a more cautious initial attack allowing Clinton's troops with the Light Infantry to the fore to deploy an effective long-range battle line with plenty of fire power and allow Generals' Heister and Luke to advance into effective musket range and apply pressure from all sides. Heister's line of Light Infantry Jaegars, Artillery and Grenadiers can apply real pressure, especially with a Line Volley Command Card or an Infantry Ranged Bonus Combat Card. Leaving the Hessian Regular Infantry (musketeer and fusilier regiments) behind is a bad call. As a block they are pretty tough. 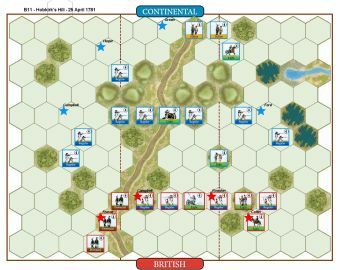 Also, General Luke's command can advance through the left-flank wood and apply shooting pressure on Sullivan's right most Provincial Infantry unit. My conclusion is the British need to be patient for a few turns and bring everything into effective range. In all 3 games the British eyes light up at the sight of all those high quality units in the flank march and experience is showing that for the British, the game cannot be won using just these units. As for the Americans, just hold the line and shoot whenever you can. Play any bonus Combat cards that help as soon as you can as you may not get a second chance. Use the Rifle infantry to move and shoot before they get whittled away. The two rear-most units of Provincials and Militia must get into the wood by the crossroads as the Provincials can effect serious fire power down the road from here. Consolidate your units around Battle Pass and abandon Beford Pass if you can. And, especially, trust in General Miles. This man is a hero and his 2 units have continually caused the British no end of trouble. This scenario is more balanced (or just plain weird) than we realised. Play it out several times, it really is balanced on a knife-edge and greatly affected by the choices the players make and the successful playing of the hands they are dealt. A surprising 9-7 win to the Americans. 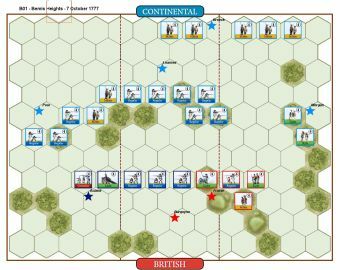 The hero of the hour was General Miles and his Provincial Infantry who held the end hill despite everything Cornwallis threw at him, destroying both of Cornwallis' Regular Infantry units and surviving the mass fire power of the Highlanders, Artillery and Light Infantry all game, to survive with Miles and one block of Provincials. Not to be outdone, General Sullivan and his last unit of Provincials advanced to rout Generals Luke's two Regular Infantry units when down to their last block. The German artillery had earlier routed to rifle fire and the German Grenadiers had been destroyed in melee although they took a unit with them. The British looked to have the upper hand earlier in the game destroying General Wyllys and his 3 units of Provincial and Rifle infantry but their inaccurate shooting later in the game cost them what looked to be a straight forward win. The end looked nigh when Clinton led the Grenadiers and Light Infantry with dragoon support behind the enemy lines and destroyed Wyllys' Rifles with firing but they then ground to a halt (no centre Command cards) and poor rally attempts by General Luke's British Regular Infantry saw his infantry and Luke himself flee the field. I sense a court martial coming up. Just shows you that you must expect the unexpected and never give up!